There’s no excuse for dull PowerPoint slideshows anymore—not with the wealth of text effects at your fingertips to help your content stand out. Even if you’re not ready for animations, we’ve already shown you text fills, shadows and effects. This follow-up covers Transitions, 3D Formats, and Rotation effects. Open a template or a blank presentation. If applicable, choose a background color, gradient, texture, or image. Enter two short lines of text on your slide. Right-click the top line, then click the Text Effects icon in the WordArt Styles group under the Drawing/Format tab. Select Transform from the drop menu, then choose one of the 40 Path or Warp presets from the list. TIP: Because the Transform menu tends to display dead-center on your screen, adjust your screen size temporarily (so the text shifts left or right), then scroll through the list of presets and see how they affect the highlighted text. Select the effect that best fits your project. When the menu disappears, right-click the text box and choose Format Shape from the Context menu. 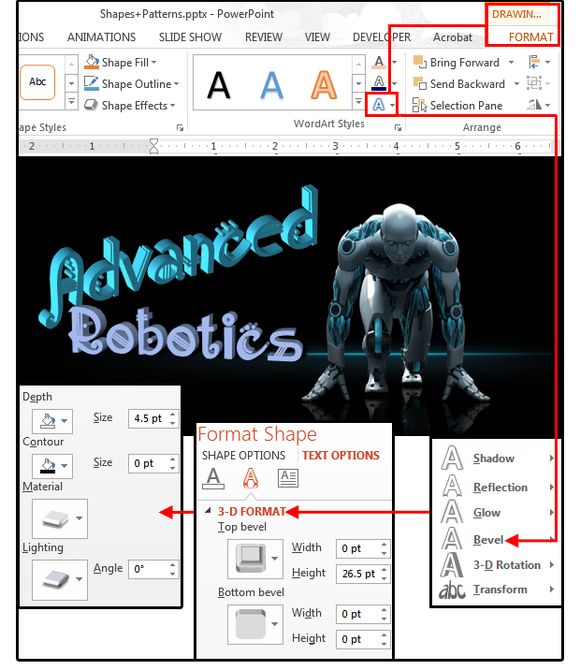 The Format Shape task pane appears on the right. Click Text Options, then choose one of the three “A” icons below the Options: Text Fill & Outline, Text Effects, or Text Box. Use the Transform feature to create great text effects that curve, circle, fisheye, step, etc. Because the Fill & Outline options influence decisions selected from the other two features, I recommend performing this task first. You can always change the colors later if they don’t mesh with the rest of your design. Also, if you have not selected a background color, image, gradient, or pattern yet, deselect the text, right-click on the background (note that the task pane changes to Format Background), and then locate or create a compatible background. Remember, you cannot have busy text and a busy background. Aim for simple elegance. It’s always easier to make decisions regarding text appeal when you have a background in place. 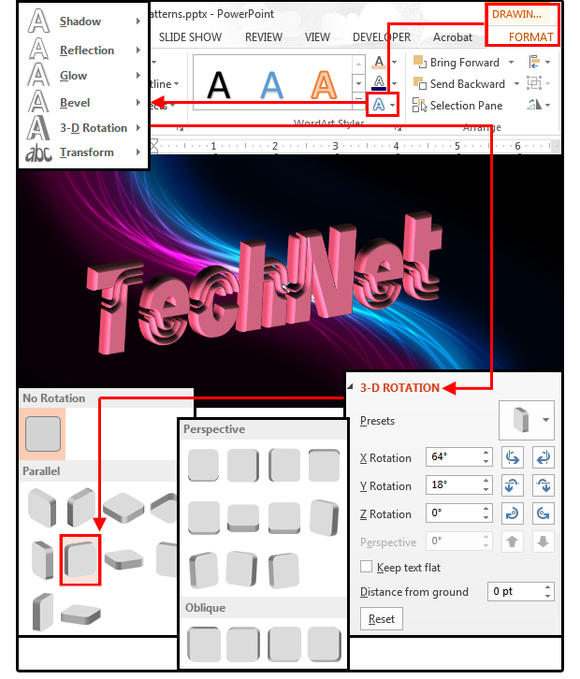 Once you add dimension, depth, and/or rotations to your text, PowerPoint views these parts of your character string as shapes (unless you’re specifically making text adjustments), which means you have to access these menus through the Format Shape > Shape Options menu. Right-click the text string, choose Size & Position from the drop menu, then click the Size & Properties “A” icon. This is where you fine-tune the text string by adjusting the Height, Width, Scaled Height /Width, and Rotation (under Size) plus the Horizontal and Vertical positions (under Position). There is no right or wrong way to do this. Just click the buttons and watch the text change. When it looks right, close this task pane, and move on to the next text string. Note: The next option on this menu is Text Box. This feature is covered below, so skip it for now. For Alt Text, use this feature to provide a textual alternative to visual information and to provide data about an image when a mouse or cursor hovers over the picture—much the same as Alt Text on websites. Use Format Size & Properties to fine tune your text transitions. 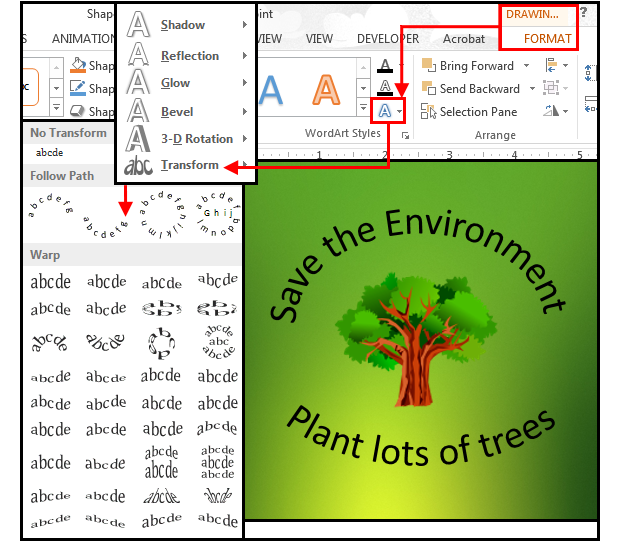 If the Format Shape task pane is still open, you can select the center “A” icon, Text Effects (from the Text Options menu) and work from this area. Scroll down to 3D Rotation, click the Presets button, and choose one from the list. Note, however, that you can choose and view only one preset at a time. If you want to watch the text change instantly as you hover over the Rotation buttons, close the Format Shape task pane and select Text Effects > 3D Rotation. This method is faster and more efficient because you can scroll, hover, and view all 25 Rotation effects in two seconds. It’s unlikely that the preset you choose will be a perfect fit, so just choose the one that’s close to the effect you want, and then modify it more precisely with the X, Y, and Z Rotation buttons. It’s fun to click through these buttons and watch the text dance all over the screen until you get it just right. There are three Rotation options: Parallel, Oblique, and Perspective for altering the perception or point of view of the text. Perspective provides views such as large foreground, small background; top focus, side focus; etc. Parallel and Oblique aren’t based on perspective; i.e., these presets just provide different angles. Note: If the Perspective button is grayed-out, it’s because you selected a non-Perspective preset; that is, Parallel or Oblique. Use 3D Rotations to shift, angle, and add perspective to your text. If your string of text still seems to lack depth, this would be a good time to review the first article and try some additional effects such as Bevel, Shadow, and/or Reflection. Note the differences between the first and second screen images above and the last three images. The first two screen images are flat, one-dimensional character strings, while the last three are all multi-dimensional characters with depth, shadows, highlights, and shading. Use the Bevels, Materials, and Lighting features under the 3D Format section to create these illusions of depth and contours. 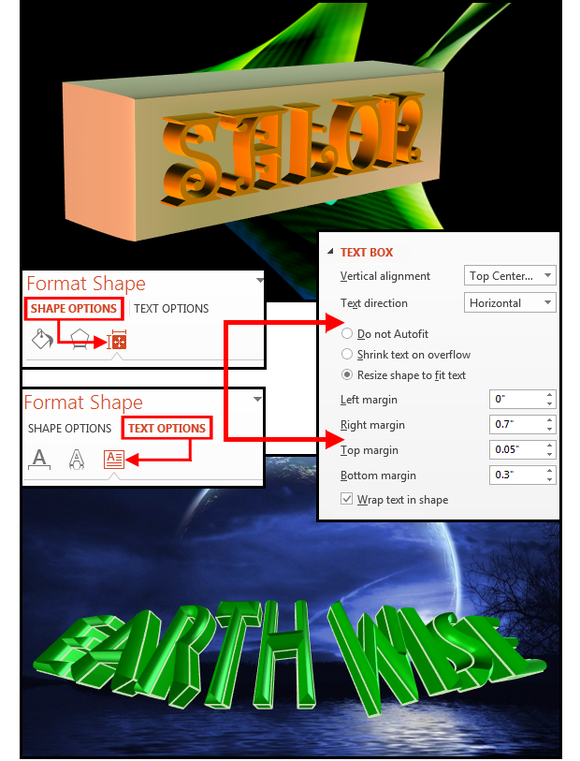 Right-click the text box and choose Format Shape > Text Options > Text Effects. In the Format Shape task pane, scroll down to 3D Format. Choose a Top or Bottom Bevel from the preset menu, then customize the Depth, Contour, Material, and Lighting. Adjust the Width and Height of the Bevel to get various levels of depth, then scroll down to 3D Rotation and re-adjust the beveled string of text to get the best view of the depths and dimensions. 3D Rotation effects with bevels add great depth and dimension. It would seem that these two features are obvious, but they overlap. As mentioned above (in number 3: Size & Position), text without dimension and basic text effects are altered through Format Shape > Text Options > Text Box. Text that has multiple effects and/or text inside a shape is altered through Format Shape > Shape Options > Size & Properties > Text Box. As shown in the last screen image, the two menus are identical and function much the same. The only difference is whether PowerPoint views your text string as text or a shape. Unfortunately, it doesn’t seem to be consistent. So, for this feature, expect a bit of trial and error. TIP: If you’re working on a text string, choose Format Shape > Text Options > Text Box first and make adjustments there. 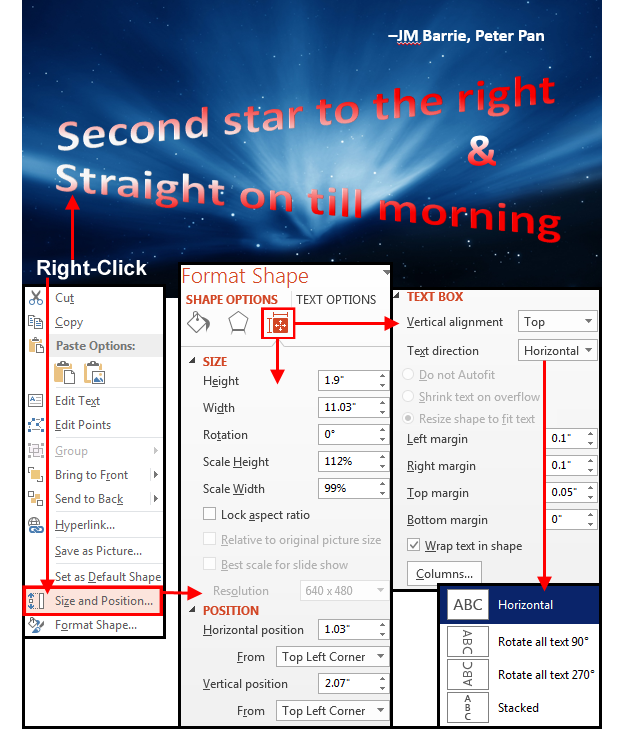 If it’s not working and the adjustments change nothing, select Format Shape > Shape Options > Size & Properties > Text Box and edit from there. So far, it’s always worked through one of these menus. Sometimes things get hung up in PowerPoint, though. If neither menu permits adjustments, select the Reset button and try again. Notice the difference between Format Text vs. Format Shape.